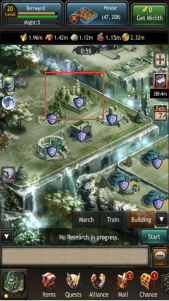 Inside is the Keep, the Great Hall, an academy and one home that was built if you went through the tutorial (you can now skip tutorial). Outside in the fields, you have a small farm, an arboretum, a quarry & an ore vein. If you have questions on any building, click on the building. Look for the small blue "i" symbol that you can tap for more information. 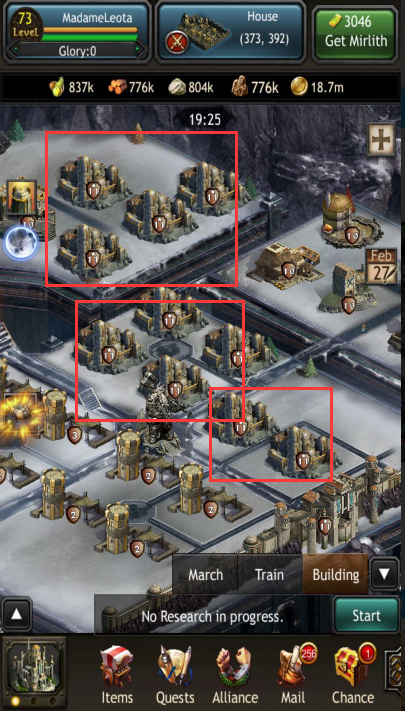 There is plenty of building and growing to do at the start of the game, and lots of room for expansion. 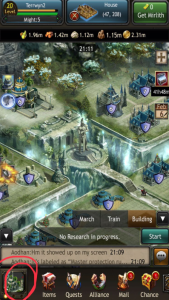 Your Keep holds a lot of information about your kingdom. If you click on your Keep, then click the 'Overview' tab, you will find the place to adjust your tax rate for your kingdom. This is also where you can hide or unhide your troops in preparation for battle. The 'Production' tab tells you how much of each resource (gold, food, wood, stone, ore, and in Mere-burg only, pearls) your kingdom is currently producing each hour. If you click on any individual resource, it will give you a further detailed breakdown of where the production is coming from. Increasing or improving any one of these numbers will increase the overall production of that resource. The 'Conquest' tab is simply a record of any wilds you have conquered for that kingdom. It will list the type of wild, the level of the wild, and its coordinates on the world map. 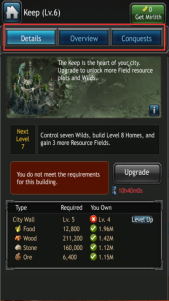 The total number of wilds you can control at any given time is equal to the level of your Keep, up to level 10. Last edited by MadameLeota; 02-06-2019 at 11:51 PM. Your Great Hall, which begins the game at level 2, is where your kingdom's heroes live. 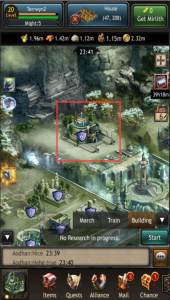 If you click on the Great Hall, then click on the 'Heroes' tab, you will see a list of all the heroes currently living in your kingdom. Underneath the photo of each hero, it shows that hero's level of experience. 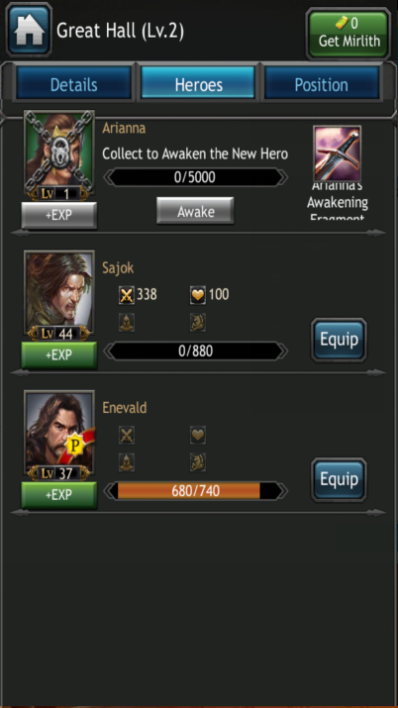 There is also a green '+ exp' button you can click if you have any training items in your inventory you would like to use to level your hero up quickly. To the right of the hero's name and photo are statistics that show the hero's attack and life strengths.These numbers will change depending upon the type of equipment the hero is using. On the right side of the screen, there is (depending on your server) a blue 'skill' button & a blue 'equip' button for each hero. There are many different skills available for your hero to enroll in that will help him or her in battle. 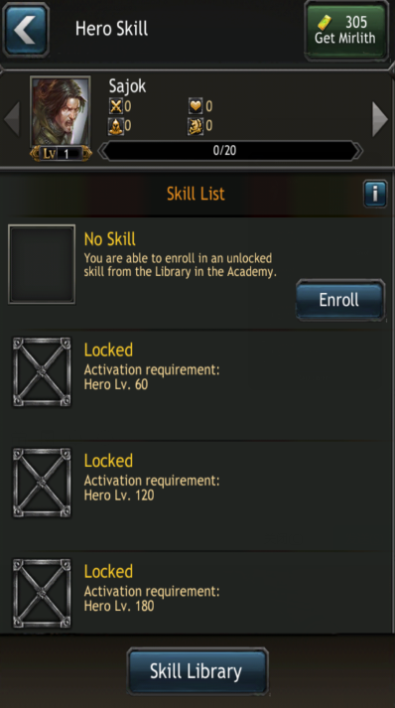 Skills must be unlocked in the Academy before heroes can use them. When you use the 'enroll' button, you are given three options. A free enrollment in a random skill is at the top. Each kingdom is given either one or two free enrollments per day. The second option is to use an enrollment letter, which are either won as prizes or purchased with Mirlith. Enrollment letters usually give your heroes better skills than the free daily chances do. At the bottom of the screen, there is a 'Learn' button. 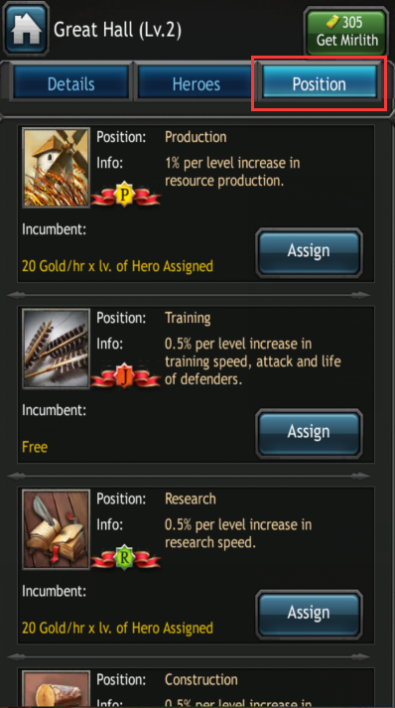 Here you can use specific skill books that are either won as prizes or purchased with crowns in the crown shop, and assign them to the hero of your choice. 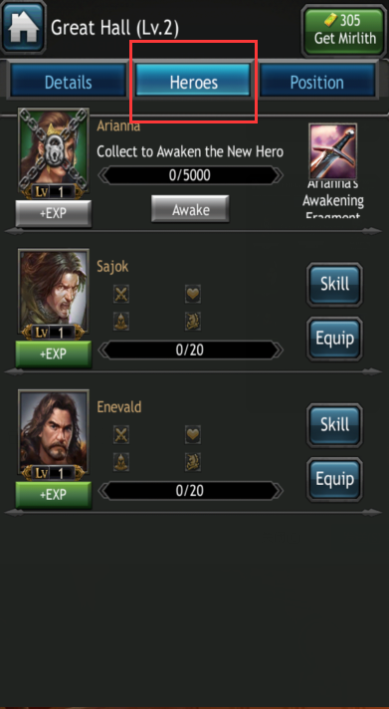 All skills a hero has currently enrolled in will appear in the Skill List under the blue 'Skill' button. As soon as you have an Ore Vein built up to level 3, and a Forge built to level 2, you can begin equipping your heroes with gear. To do this, click on your Great Hall, then the 'Heroes' tab, then 'equip'. The game will begin with a very basic Arborist's sword. You can either drop & drag, or click on the gear to equip your hero.